Prepare 9x13 glass pan with non-stick cooking spray. In a large pan over low heat, melt butter and marshmallows, stirring constantly until creamy and smooth. Stir in cereal by hand and mix well. ALTERNATE MICROWAVE DIRECTIONS: In large microwave-safe bowl, cook butter and marshmallows on high for 2 minutes. Remove from microwave and stir, then return to micro to cook another minute. Remove from micro and stir until creamy and smooth. Stir in cereal and mix well. Pour cereal mixture into prepared pan. Using a spatula sprayed with non-stick cooking spray, gently press the mixture until even and flat. Allow to cool 10 minutes. Line a large cutting board with parchment or wax paper. Flip the pan over onto the paper, releasing the cereal mixture in a single block. 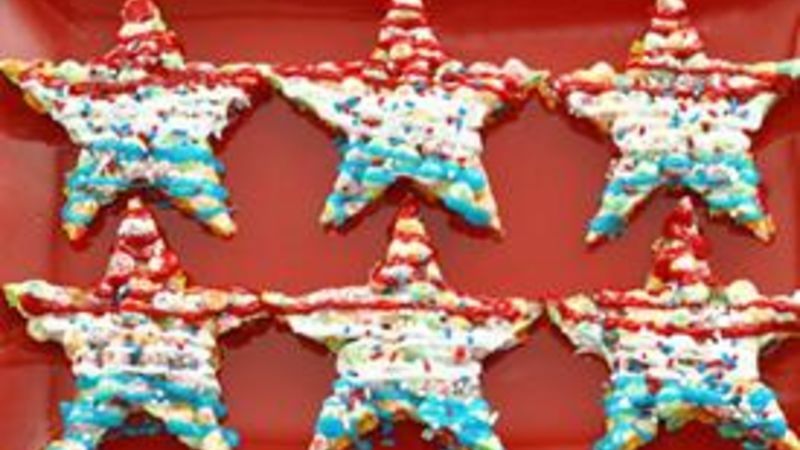 Use a star-shaped cookie cutter to cut bars into star shapes. Drizzle bars with red, white and blue cookie icing and immediately dust with sprinkles. Serve immediately. Store leftovers in an air-tight container no more than a day. Press cookie-pop sticks into bottom of bars and serve pop-style. Fruity rainbow-colored Trix make their way into star-spangled crispie bars just in time for the 4th of July! These marshmallow bars made with Trix cereal and a few special effects make the classic version look and taste anemic! But -- you guessed it -- they're just as easy as ever to make. Start with the 3 essentials -- Trix cereal, mallows 'n buttah. So...you know this drill, yah? Melt the butter and mallows over low heat (nuker works too) until they're totally melted smooth. I know you know this but I'm gonna say it anyway: stir it constantly if it's over the stove. You know why. Pour that goop into a 9x13" glass pan sprayed with (are you listening?) non-stick cooking spray. Let that set up about 10 minutes, then flip it out upside down onto a large cutting board covered with parchment or wax paper. I love my pretty star cookie cutter. It makes me happy to use it. It looks really happy to be used, too. Jsyk, I used my wooly-mammoth-sized cutter. You'll get tons more bars if you use a smaller one. But these big ones look like something Hollywood should have on a sidewalk somewhere. Starlet worthy? I think SO. These are delishalicious just like this. So if it's not the 4th, you could stop right here. But it is the 4th, so let's pump 'em up a bit with the special FX: red, white and blue Betty Crocker Cookie Icing, followed by sprinkles that stick to the icing like sand on your beachy feet. Start the Star Spangled Banner on my iPod. NOW. If you need to stack them, put parchment or wax paper between them or you'll have the Leaning Tower of Stuck-together Stars.